An artist's interpretation of a manned mission to a near Earth asteroid using NASA's new Orion spacecraft. A visit by humans to an asteroid may take a step closer toreality at a NASA workshop this week. A spirit of excitement is bubbling over NASA's new aim, notunlike when the agency first aimed to land a man on the moon, NASA's LaurieLeshin said ahead of the two-day session, set for Tuesday and Wednesday inWashington, D.C.
Planetary defense against killerspace rocks also has a place on the agenda. The human exploration of a near-Earth object would rely uponthe experiences of robotic expeditions like Japan'sHayabusa mission, which recently returned to Earth with particles that maybe asteroid samples. Experts and leaders from government, academia, industry andthe international community are expected to weigh in on what would be required tostage a mission to a near-Earth object, according to Leshin, deputy associateadministrator of NASA's Exploration Systems Mission Directorate. "Between Kennedy?s speech at Rice and NeilArmstrong?s first steps, there were a lot of meetings like this,"Leshin told SPACE.com. "We are excited to begin to bring togetherthe range of ideas that exist for human exploration of NEOs and start to focusthem on a plan forward." In 1962, President John F. Kennedy gave his historic speechat Rice University discussing the goal of putting an American on the moon by theend of the decade. It came one year after he announced the goal to Congress. Armstrong commanded the first manned moon landing mission,in July 1969. The new goal of sending astronauts to land on asteroids ispart of President Barack Obama's plan for the future of the NationalAeronautics and Space Administration. Obama announced the new direction forNASA in April, two months after proposing a 2011 NASA budget?that included thecancellation of the agency's moon-oriented Constellation program. 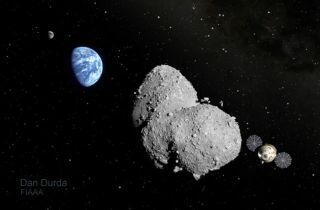 The Congress is still discussing NASA's 2011 budget (theHouse is expected to revisit the issue next month), but that hasn't stoppedscientists from taking a look at what a manned mission to an asteroid would entail. That's where this week's workshop comes in. Goals for the meeting include boosting the collectiveunderstanding of NEOs and laying out NASA's plans for the human mission. NASAalso hopes to collect outside input on any proposed mission objectives andidentify any gaps in technology or know-how. Regarding planetary defense, experts would considerquestions such as what remains unknown about NEOs and what technologies could beused to stop objects that pose a threat to Earth. A NASA panel recently calledfor the creation of a PlanetaryDefense Coordination Office and suggested making planetary defense atop-level NASA strategic goal. The meeting also will consider whether a human mission to anNEO could work in tandem with a mission to the moon or Mars. Obama's currentplan for NASA would focus on ambitious heavy-lift rockets to carryastronauts beyond low-Earth orbit to an asteroid and Mars. This story has been corrected to reflect that President Kennedy first announced the intent to send astronauts to the moon in May 1961, then discussed the plans at Rice University in September 1962.